Last year, from October to December, we asked you to tell us what the transportation priorities should be for BC over the next 10 years. We call it BC on the Move. And you responded. A lot. It was fantastic. 100 meetings with 550 representatives of First Nations, local governments, chambers of commerce, ports and airports and various other stakeholders. 70 meetings on Vancouver Island by our transportation ministry’s Parliamentary Secretary Jordan Sturdy around the needs of island communities. First, thanks. Thank you for being a part of the BC on the Move initiative and sharing what’s important to you. The amount of interest and engagement was amazing and only helped the ministry in crafting this 10 year plan. 95% said keep highways, bridges and side roads in good condition. 87% said expand and increase transit services. 73% said expand highway capacity and upgrade key highways and bridge to facilitate heavy hauling. 72% said enhance cycling infrastructure and improve transportation choices. 70% said support regional and small community airports. Highlights: major investment to resurface 1,000 kms of provincial highways annually; a 50% increase in bridge rehab funding; up to 30 projects annually to improve provincial side road conditions; up to 20 projects a year to upgrade northeastern BC roads to support the natural gas industry; and a 3 year investment for new and upgraded rest areas. Highlights: a double in funding for a new “Road Safety Improvement Program” that includes avalanche infrastructure, community safety improvements, and the installation of variable-speed-limit signs; investment in intersection safety improvements; and upgrade driver information systems like DriveBC and highway webcams. Highlights: A big investment ($1 billion) over the next 3 years to upgrade our highway network, including: Highway 1 from Kamloops to the Alberta Border, Highway 97 in the Okanagan Valley, Highway 3 Crowsnest, Highway 5 Yellowhead, Highway 97 Cariboo Connector, Vancouver Island and Lower Mainland Highways, and Northwest BC Highways #16, #97 North and #2. Highlights: upgrade and replace bridges and overpasses to accommodate heavier and larger loads industry needs to move, including 10 major bridges in the interior and northern BC; streamline permitting and reduce the number of truck permits required; and construct 10 new truck-inspection pullouts throughout BC. Highlights: provide BC Transit $312 million in operating contributions over the next 3 years; work with local communities to replace half of BC Transit’s fleet (about 500 busses) over the next five years; and work on a design to extend the Douglas Street bus lanes from Tolmie to Uptown in Victoria. Highlights invest $18 million over the next 3 years to build new bike lanes and trails; and widen shoulders, double the frequency of sweeping and implement safety improvements on provincial highways in areas with large amounts of cyclists. Highlights: invest $24 million in the new BC Air Access Program, which will help community airports access millions in funding over the next 3 years; and support development of the aviation industry near airports. Highlights: invest in infrastructure that helps access to ports and increase container handling capacity and continue to work with stakeholders to determine how best to support Liquefied Natural Gas (LNG) facilities. Highlights: continue to pursue strategies to achieve a vision of an affordable, sustainable, and efficient coastal ferry service, including support BC Ferries’ move to LNG, alternative technologies such as the new cable ferry to Denman Island, and its new reservation system; and continue to renew inland ferry assets. Highlights: partner with First Nations on projects that support economic development on their lands; and help with more employment and training opportunities for First Nations through our ministry’s major projects. Highlights: upgrade rest areas across BC to improve accessibility for persons with limited mobility, including curb letdowns and accessible washrooms; and increase the number of wheelchair-accessible taxis in communities around BC; and partner with Translink to make additional accessibility upgrades to SkyTrain stations. Highlights: invest $6 million over 3 years to conserve habitat and improve fish and wildlife protection; invest $3.9 million over 3 years to deliver invasive plant management programs; and continue to invest in transit and cycling programs. 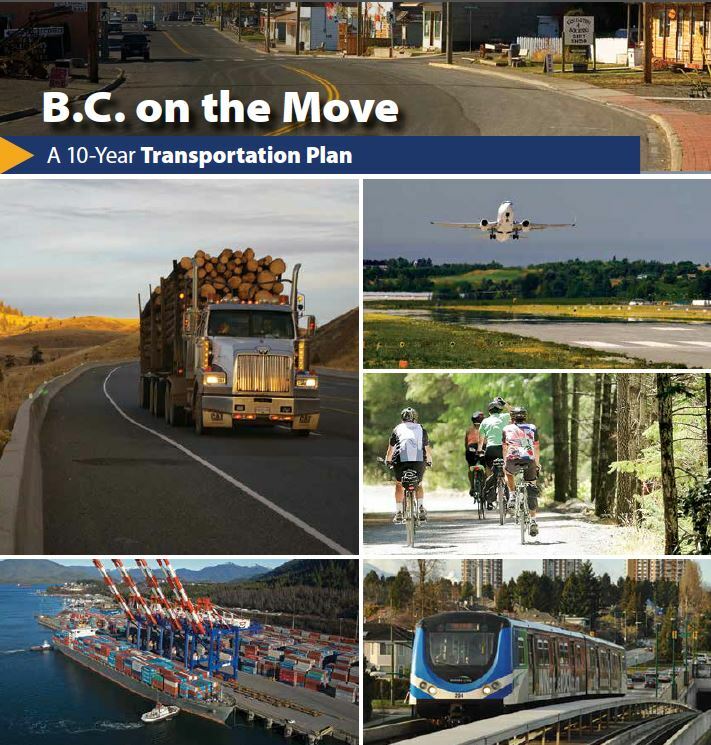 Of course this is just a summary of some of the highlights from the BC on the Move plan. If you’d like all the details and actions to come, check out the full report. We’ll also be adding to this blog any future announcements that fall under our 10-year transportation plan. Stanley Park Causeway Safety Improvements – a $7-million commitment toward improving pedestrian and cyclist safety along the causeway, including widening the pathways and installing safety fencing on both sides of the causeway. Plans and designs for this project include input from the Vancouver Park Board, the City of Vancouver, local First Nations, a variety of stakeholder groups and the public. Vancouver Island Improvements – assess the potential for a future interchange on Highway 1 at McKenzie Avenue to address the “Colwood Crawl” with preliminary engineering work already underway; design work to extend the northbound Douglas Street bus lane from Tolmie Avenue to Uptown Mall; widen the shoulders on Highway 14 east of Sooke; and plan to deliver key highway safety improvements in locations such as Highway 4 west of Port Alberni and the Malahat corridor on Highway 1. We’re also looking at the costs and benefits of an alternate connection between the Island Highway and Port Alberni, to improve mobility for motorists. Nanaimo Highway Improvements – dual left-turn lanes on Highway 19 in Nanaimo (also known as the Nanaimo Parkway) at two key intersections, including: constructing a second southbound left-turn lane on the Nanaimo Parkway at the intersection with Jinglepot Road and Mostar Road and at the intersection with Jinglepot Road and Third Street, and constructing a second through lane on the east side of both intersections, changing the signal timing at both locations. New Cariboo Connector 4-Laning Going to Tender – project to four-lane Highway 97 between Stone Creek and Williams Road is going to tender, and includes replacing the Red Rock CN Rail overhead. This will also increase the height clearance to 5.5 metres, improving the CN railway alignment and allowing greater clearance for larger trucks and loads. This project is the next local project in Phase 2 of the Cariboo Connector. Sande Avenue Intersection Improvements on Highway 16 – at the intersection of Sande Ave. and Keith Ave., traffic signals will be installed, and a new eastbound left turn lane and improvements to the right turn lanes will improve traffic flow and the intersection’s ability to handle more traffic. Highway 97 at Monte Creek Safety Improvements – in spring of 2015, vehicle-activated LED arrow signs will be installed at both the north and south ends of the corridor to guide drivers around the curves; pedestrian signs outlined with LEDs will be installed at the south end by the Monte Lake RV and Campground, illuminating to warn motorists that pedestrians may be walking along or crossing the highway; and speed-reduction pavement markings will be installed on the curve at the north end of this section of Highway 97 near Paxton Road to act as a traffic-calming device that creates an optical illusion for drivers through the curve, which in turn leads them to slow down. Highway Resurfacing Kicks Off with Three Coquihalla Projects – a 25-kilometre stretch of the Coquihalla Highway northbound will be resurfaced from the Logan Lake Interchange to the Afton Overpass. Southbound on the Coquihalla, a five-kilometre section will be resurfaced from the Afton Overpass to Inks Lake Overpass. In the Merritt area, there will be resurfacing of a 10-kilometre stretch of Highway 5 between the Coldwater Interchange and Comstock Road, and 38 kilometres north of Hope, resurfacing will take place from the Snowshed Hill north to Coquihalla Lakes. Approximately 14 kilometres of highway northbound and 16 kilometres southbound will be resurfaced. The Britton Creek rest area will also be resurfaced. Better Access to Highway 1 in Langford – as a result of partnership between the Province and the City of Langford, a new southbound off-ramp at the Leigh Road Interchange on Highway 1 and a new southbound acceleration lane from the Westshore Parkway onto Highway 1 will be constructed. The whole project is anticipated to run from summer to fall 2015. Cariboo Connector Quesnel Four Laning – work is underway to four lane Highway 97 between Dragon Lake Road and Quartz Road south of Quesnel, to improve safety and mobility along this important corridor. Completion on the project is anticipated for late summer 2016. And More!…to keep up with all the latest BC on the Move-related announcements, check to the BC Newsroom. re: Nanaimo highway improvements, I contacted the city regarding this issue and they informed me it was a provincial jurisdiction. After the upgrades to this intersection and with the increase to traffic flow on Jinglepot rd the signals now only allow a very few vehicles thru the intersection from Jinglepot. The left turn light onto Jinglepot from the highway is also to short for the traffic affecting that maneuver. The cross signals on Highway 19A for Mostar and Rutherford are also short. Both intersection shortfalls are leading to vehicles accelerating and placing the safety of the intersection in question. Could u have someone review this intersection signalling and advise me of the findings please. We have sent your questions forward to our local area manager for review. Stay tuned. We sent your question forward and the area manager let us know that ministry signals are timed to optimize traffic on the highway, which sometimes means it is timed to the detriment of the side streets. This is to facilitate movement of the very large traffic volumes on Highway 19. We understand the frustration of the side street users, when signals are getting close to capacity and growth along the corridor has put a lot of strain on the highway capacity. The signal operations at the Mostar signal were re-timed when the dual left turns were installed in 2016, so the signal timing is very new compared to other signals on the island. The signal at Jingle Pot/Mostar allows for a maximum of 17 seconds of green time for Jingle pot Road, and 27 seconds for the Mostar Road side. Because this signal is split-phased (meaning that the Jingle Pot and Mostar sides get separate green times), we cannot allocate a lot of green time to each side, because it’s cumulative, and the impact to the highway through traffic is unacceptably high. Combined, the side streets are allowed 44 seconds of green time, while the green time on through traffic on the highway is 45 seconds. So we are giving the side streets equal time (split between the two) to the highway traffic. The same is true for the Mostar/Rutherford signals – unfortunately geometric limitations mean that the signals are split-phased, and the side streets must be, by necessity, shorter in allowable green time in order to facilitate the through movements on the highway. We hope that this information helps! If France can build new bridges and motorways in only a couple of years and repave highways in days not months, we should be able to do it too. Lets stop padding the pockets of “dead wood” redundant civil servants and, irresponsible contractors and simply move forward. We are sorry to hear your frustration – is there a project in particular you are concerned about? Perhaps we can get you more information on it? If you’re not going to fix it, at least stop lying to us about it. Just read the reply to the first comment. TranBC should be ashamed saying BS like that! Safety biggest priority? – what a joke!! NOTHING being done at all on the most dangerous sections… no increased police patrol, no descreased speed limit, no physical improvements to the road way whatsoever. Would have to agree with the original poster on this one – I’d be surprised if this happened in the next 20 years, more likely 30. Thanks for feedback and sharing your concerns. Though you may disagree, safety is our biggest priority. I’ve passed on your comments, most specifically about Highway 1, Kamloops to Alberta as that is the area you identified. We’ll certainly be sharing more about this as we’ve mentioned numerous projects in BC on the Move on advancing four-laning projects between Kamloops and Golden. Commend you for survey and delivery on action plan. Could you include Revelstoke & its airport on the map? Also could you tell us if there was any conversation about the impending autonomous (self driving) vehicle and its impact on transportation? They should start to arrive in 5-10 years and will mean significant changes on the way roadways, cities and life are shaped in BC. I imagine this plan is revisited and updated regularly? thx! So will non certified airports still be able to get funding? ALSO Tesla cars will start self-driving this summer http://mashable.com/2015/03/19/tesla-google-driverless-car with others coming soon after. This is very different than solar roadways. Thanks for the follow up. In regards to airports and funding, Provincial airport programs have always been available to all public facilities, whether certified or registered (Revelstoke is registered). It is an application process with competition for limited resources, though, so there is never a guarantee of funding. As for the difference between certified and registered, an airport must be certified in order to receive scheduled passenger services. Sorry for the mis-communication regarding the blog we shared. It was less about solar roadways and more about the types of questions we ask whenever approached with new and emerging technology. We are monitoring the developments and tests that are being carried out around self-driving cars in other jurisdictions and as the technologies surrounding self-driving car technology continues to evolve, we will consider industry standards. Prior to these vehicles being put into use on our highways, they would have to pass federal and provincial safety standards. Currently they aren’t allowed on our public roads as legislation requires motor vehicles to be operated by a person. so you are going to continue to “advance four laning projects between Kamloops and Golden”. I guess that this will be at the current rate of, at most, a few km per annum – with priority being given to flat, easy sections and work on the expensive, difficult, mountain sections put off. Therefore, I don’t expect completion of the four laning in the period covered by this 10 year plan, or in that of the next 10 year plan. Perhaps it might be completed some time during the 10 year plan after that. Sadly, I anticipate many more deaths on British Columbia’s most lethal highway in the interim. Sorry for your concern and frustration. Safety is the biggest priority for us, as reflected in this 10-year plan, for all our highways and the various terrain they cover. More announcements and timelines for our projects will be shared as the BC on the Move plan unfolds. Yes, that study was done by the Ministry TWENTY FOUR YEARS AGO. I think that says everything that needs to be said.